… I chickened out on showing you my new dye space. I’m going to get it up and running, and make it look a bit prettier and then I’ll show it to you. In the meantime I’m sorting out what is going into the sale on the 26th. Stay tuned. In other news, FB is going to be two (two!) in the middle of October, and though my midwife is convinced I’m not going to drop until week 41 (which is a week after his birthday. Yes. I know.) I’m hard at work trying to get his birthday, and Christmas generally well under way with plenty of time to spare. 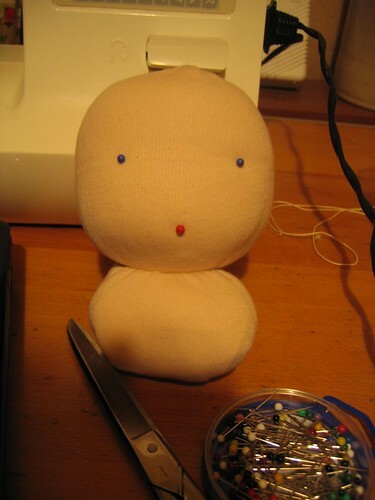 With that in mind I stayed up far too late last night to start work on the Waldorf doll that I’m making him. I’ve been wanting to have a go at one of these for AGES, but I’d heard they are tricky, and kept putting it off. However I’d really like FB to have a little buddy who he can go on adventures with, so I’m giving it a go. I’ll do my best to document how it goes here, for those who are interested. Maybe it won’t be so scary, and others will decided to have a go too? Here’s hoping. I’m working from Making Waldorf Dolls by Maricristin Sealey, which is a great book and a classic if you want to make these sorts of dolls. I got my supplies from Myriad Online, which is a great resource for natural toys and Waldorf books if you’re based in the UK. It was relatively painless. Even without a third hand to help tie the knots. I’m really pleased with how smooth the face is (no bunching!) though the eyeline isn’t a pronounced as maybe it would be with more practice. ← Short Tales from a House Move – Part 3 – Not Bigger. Just better for us. Show us! Show us! The Waldorf doll looks awesome – can’t wait to see it finished. New sewing table – very exciting! The waldorf doll looks ace – am very keen to see any progress. Also keen to hear about the midwife decision/experience. And October? My brain just isn’t keeping up well. Our boys will be two soon? And your due then? then that means I’m due….man, I gotta get knitting. Hope your ok – life is resuming normality here so would be ace to catch up soon.